Based on PAGASA available data, Tropical Depression Wilma (Bagyong Wilma) weakens into a low-pressure area (LPA) and estimated at Northeast of Puerto Princesa City, Palawan. PAGASA weather bulletin as of 5 a.m. today, "the Low Pressure Area LPA was estimated based on all available data at 190 km Northeast of Puerto Princesa City, Palawa, embedded along the Intertropical Convergence Zone (ITCZ)." 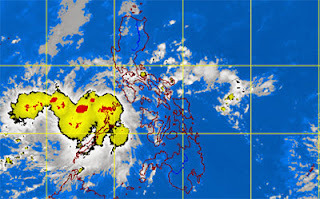 The Northern seaboard of Northern Luzon is affected by strong to gale force winds. The partly cloudy to cloudy skies with light rains is expected weather to Batanes, Calayan, Babuyan, Northern coast of Cagayan, and Northern coast of Ilocos Norte. PAGASA advised fishing boats and other small seacrafts not to venture out into the sea while larger sea vessels are alerted against big waves. For the meantime, please bookmark this page now or visit this site more often for you to be updated. You may also share this post to your friends so they may know about Bagyong Wilma. Comments or suggestions about "Bagyong Wilma weakens into a low-pressure area - PAGASA" is important to us, you may share it by using the comment box below.